VIZ Pictures, an affiliate of VIZ Media, LLC that focuses on Japanese live-action film distribution, will debut the Blu-ray Death Note Collection on August 24th, 2010. The 3-disc set includes 2 feature films – Death Note and Death Note II: the Last name – as well as a bonus disc containing more than two hours of all new behind-the-scenes footage. Both films feature Japanese audio with English subtitles as well as an English dubbed dialogue track. MSRP for the Death Note Collection is $39.98 U.S. / $57.99 CAN. To celebrate the new release, VIZ Pictures will hold a special screening of both films at VIZ Cinema, located inside NEW PEOPLE in San Francisco’s Japantown (1746 Post St., San Francisco, CA 94115) on Saturday, September 4th. Death Note plays at 12:00 noon and Death Note II screens at 2:30pm. Special combo tickets are available for $35.00 and include passes for the screenings, the Blu-ray release and a poster. Regular combo tickets are $15.00 for tickets for both shows (no Blu-ray or poster), while general admission for one screening is $10.00. Tickets and information are available at www.vizcinema.com. 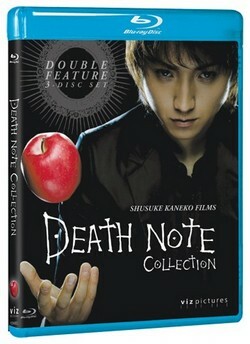 As a special offer to U.S. and Canadian Death Note fans, VIZ Pictures will award three lucky winners posters for Death Note and Death Note II along with an autograph from one of the three lead actors – Tatsuya Fujiwara (who played Light), Erika Toda (Misa) and actor Kenichi Matusyama (L/Ryuzaki), one of the most promising actors in Japan, who can also be seen in films such as NANA (2006), Linda Linda Linda (2005) and Detroit Metal City (2008). The campaign runs until September 24th. For more details about the campaign, visit www.viz-pictures.com. Death Note is a battle of wits based on the acclaimed manga series written by Tsugumi Ohba and illustrated by Takeshi Obata (published in North America by VIZ Media, rated ‘T+’ for Older Teens). Law student Light is upset with the justice system and when he finds the Death Note dropped by a Shinigami death god, he vows to rid the world of evil. Any human whose name is written in the notebook dies. As criminals all over the world begin to perish mysteriously, a world-renowned detective known only as ‘L’ is put on the case to stop this serial killer that the public calls ‘Kira.” The battle between Light and L continues in Death Note II: the Last name as Light joins the investigation team. L suspects Light of being Kira while Light attempts to learn L’s real name. Time becomes even more crucial with the appearance of a second Kira. Whose name will be the last written in the Death Note? For more information on Death Note or other VIZ Pictures titles, please visit www.viz-pictures.com.